Algae culture grown using recycled phosphorus. Thanks to modern science, we no longer need to wait millions of years for algae to be squeezed and pressed by geological forces to become crude oil. Through a process called hydrothermal liquefaction, algae can be pressurized into biocrude in less than an hour. So, what's holding algae back as a sustainable source of renewable fuel? One issue is phosphorus. Algae can be grown in ponds and converted into gasoline, diesel, and even jet fuel. Phosphorus helps the algae grow big and green, full of carbohydrates and lipids—the raw materials used to make biofuel. Mined phosphorus, however, is non-renewable—there's only so much available. For 5 percent of the U.S. fuel supply to come from algae, it would require 50 percent of the current U.S. phosphorus supply. Through a project supported by DOE's Bioenergy Technologies Office, researchers at PNNL recently discovered a way to recycle phosphorus used in the algae-to-biocrude process. 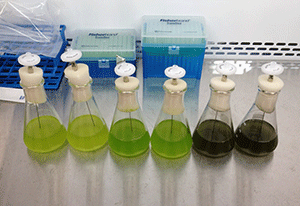 During the conversion process, oils are separated out of algae to produce biocrude. Left behind is a water-based solution, as well as solid minerals full of everything that went into growing the algae, phosphorus, magnesium, calcium, and nitrogen. Researchers at PNNL have developed a method to recover and recycle nearly 100 percent of phosphorus used to grow algae. The team's sights are now set on nitrogen and other minerals. The goal is to be able to recycle 100 percent of the nutrients that go into growing algae. If successful, the process will pave the way for more sustainable, cost-effective production of biofuels from algae.